Wigs have a rich history and have been worn for centuries by both men and women. In modern times wigs are worn for fashion and aesthetic purposes as well as men or women with severe hair loss, alopecia areata or chemotherapy. Wigs can range from the-super expensive (some fetch $1,500 or more) to the somewhat affordable ($300 to $400) and are also sold online. Some companies offer payment plans for their wigs, and if you are a fashionista who changes her look as often as her clothes, it is an investment that will save you money over time, as these wigs can last for years. Lace wigs are given that name because they are often made with a French or Swiss-lace cap base that can be custom-fitted and bonded to the head. If you apply the wig just right, it should look completely natural, as if the hair were growing out of your own scalp. Whether you buy a French or Swiss-lace wig, cutting the lace will be a delicate process. Before you begin, place a wig cap (flesh-toned for a realistic look) over your hair and situate the wig. Mark where you want the wig to sit on your forehead with something erasable, like a liquid liner. Use that marking to guide how you cut your lace. Begin cutting the excess lace around the wig to your liking. Beginners should leave at least a half inch of lace all the way around until they get used to shaping their lace. Pros generally cut extremely close to the wigs hairline for a more natural look.If you picked the right color lace for your skin type, the lace will disappear upon contact with your skin either way. To apply the wig properly, you must first prep the area around your hairline. The adhesive will stick best if your skin is clean and dry. Oil or moisture on your hairline will deter a strong hold. Once skin is prepped, place a store bought scalp protector all around your head where the lace will be applied. The protector can be found in the accessories section of the lace wig website and should be bought, along with adhesives, at the time of wig purchase. Applying the adhesive can be challenging and it may take a newbie quite a few messy tries to get it right. Patience is key. Use an applicator that suits you, like a disposable glue brush, Q-tips or makeup applicator. 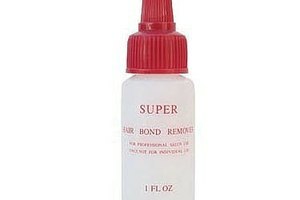 If you decide to use a glue adhesive, make sure the glue is safe for lace wigs and suits your needs. Once you apply the glue to your wig line, allow it to dry before placing the unit on your head. If you do not, the wig won't secure properly and will slide away from your forehead. If you decide to use a tape adhesive, tape with strips are typically more manageable. It is very common to use both tape and glue; putting tape in the back and glue in the front. Apply the strips of tape along the wig line. To apply the unit, carefully place it on your head, being sure to keep stray hairs out of the glue (pulling back the hair along the hairline with small clips may help) and press the lace into the glue or adhesive. Firmly press the wig down, all the way around, until you are satisfied you've secured the wig to the adhesives. Make sure none of the lace is lifting up when you are done. If one area is lifting, use a Q-tip to add an extra dot of glue and test to ensure the wig is secure once again. Once you have the wig on your head, it may be tempting to style and comb it. Don't. Unless stated otherwise, both tape and glue adhesives have to cure for about 24 to 48 hours before any excessive pulling on the hair can occur. If you follow the rules, the bond should stay strong for a good while. Find a quality wig, as this can make or break your style. Remy, Malaysian or Asian hair may cost a bit more, but they will last longer and be easier to manage. On the other hand, cheaper synthetic or basic human-hair pieces will shed and mat, needing to be tossed away sooner. Still, you may want to start with a less expensive wig as you learn how to apply them before graduating to something more costly. Be sure to get lace that matches your skin tone: Wig lace can come in transparent, light brown, brown and dark brown for different skin types. If you are uncertain as to which to get, contact the seller, who will be more than happy to walk you through it. If you tend to work out or sweat, you may notice that the bond loosens. If you don't pull on the wig, the bond will reset itself and your wig-attachment base should remain strong. Keep the wig clean and cared for and you will have something in your beauty arsenal that will last you for years to come.